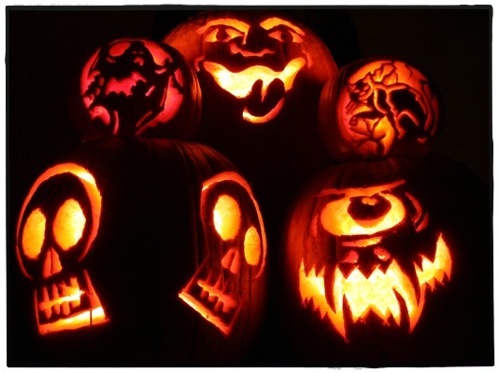 Have a safe and happy Halloween everyone! More importantly, don’t forget that the Christmas season starts tomorrow! This comment on Scripting.com was quite exciting for me. Using Smartphones to implement point-to-point services using old “BBS” style technology – diallers, modems and the like. Exceedingly easy to implement, and potentially quite powerful in its impact. Imagine clicking a link on a web page that caused your phone to dial a number, negotiate a connection and allowed two different handsets to exchange data on a private link that was completely disconnected from the Internet? This is a *very* cool idea. Here are just a few of the neat sayings that I came across in a quick skim – recognize any of them? ‘Tis easier to know how to speak, than how to be silent. ‘Tis net the Action, but the Intention, that is good or bad. ‘Tis not the Beard, that makes the Philosopher. ‘Tis not your Posterity, but your Actions, that will perpetuate your Memory. ‘Tis the Horse that stumbles, and not the Saddle. ‘Tis the last Feather, that breaks the Horse’s Back. To be employ’d in uselete Things, is half to be idle. Its funny, Microsoft used to be *the thing*. They were the king of the hill, top of the heap, A number one. I mean, they still have a really great business, a lot of really good assets and they seem to have a lot of great ideas, but their performance is really in the shitter. I was thinking about this earlier today, so I went to their website – first time in years. I was a bit surprised. It didn’t feel like a credible website in the least. Cluttered, distracting and all the copy was distilled into just a few obtuse words. I suppose someone might have felt that obtuse created mystery and intrigue that was suppose to somehow get people to click-through or something. I mostly just found it annoying. Poking around a bit to get a better sense of their priorities, I came across this page and it struck me what most ails Microsoft these past few years. Windows Live, the Cloud, Mobile, blah, blah, blah, blah. And worse, I think the folks in charge in Redmond actually believe that their strategy is going to sell software. Steve Ballmer – you used to be a sales guy, what sells software? That’s right. Not Strategy. Ballmer & Co. need to pull their collective heads out of The Cloud and remember one thing. Microsoft is a software company, not a strategy company. If they want to win, they have to get back to shipping great software that people use everyday. Software that Microsoft is uniquely positioned to provide. In the meantime, they are getting beat, every single day, by thousands of app developers, by Apple, by Samsung, by Google and most every startup between San Jose and Oakland, and there isn’t any strategy in the world that can change that for them. I think VISA* might hate its merchants. When someone uses a stolen credit card to buy something from a merchant, the actual card holder will usually dispute the charge with VISA. VISA will then credit the card holder and charge the merchant a processing fee (usually about $10 or so). At this point the merchant is out of pocket for any merchandise they shipped, plus the $10 handling fee they have to pay to VISA. If this happens often enough, VISA will levy a fine against the merchant. This could be tens of thousands, and in the worst cases, hundreds of thousands of dollars. If the merchant doesn’t pay, their ability to accept credit cards will be revoked. Thing is, VISA is the one that approved the purchase in the first place! They have no real safeguards in place to ensure that the person requesting the transaction is the actual cardholder. They’ve implemented a few half-hearted attempts to provide cardholder security in the past – chips and PIN numbers, but their basic security model is so fundamentally flawed that it is almost trivial to circumvent. VISA is very slow to move away from changing their model because the current process is all upside for them – they make a huge profit from the transaction and processing fees and carry very little of the risk themselves and put the real burden of security on the cardholder and merchant. *Mastercard and AMEX are no better. 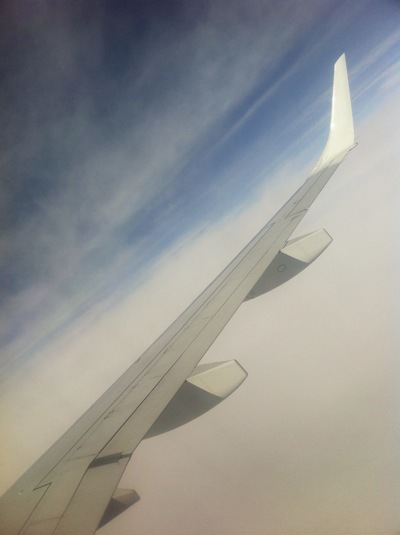 …I have to remind myself that my outlook simply depends on my perspective. And that by changing my perspective, I can change my outlook. So while it might be rainy and dark down here on the ground, a few thousand feet up, the view is definitely better. 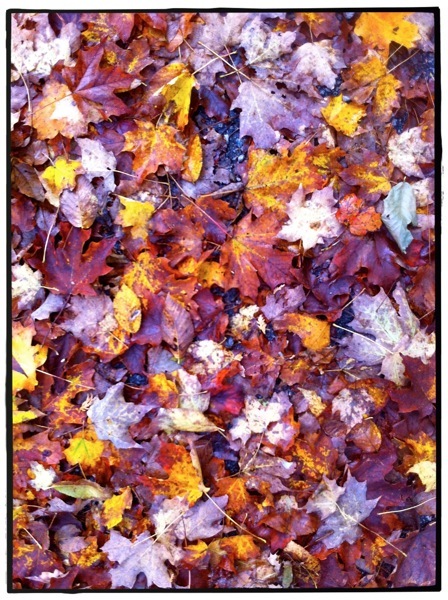 I went for a walk in the yard this afternoon. 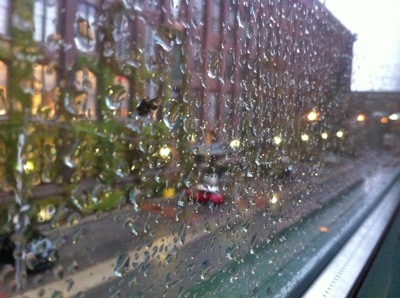 It seems lonely. Not for me I mean, I wasn’t lonely. The yard itself feels like it’s lonely. The leaves and flowers and birds that kept it company over the spring and through the summer have left for the next few months. Perhaps the coming snow will keep it company. As a political movement, Occupy Wall Street clearly resonates in the United States. At least as much as the Tea Party did, except perhaps on a more human scale. This weekend will bring us the Occupy Toronto and other Occupy Canada movements, and we’ll see what kind of traction they get north of the border. It doesn’t resonate with me. I’m distracted by the need for Occupy Burundi, Occupy Kinshasa, Occupy Zimbabwe. Financial districts barely exist in these countries. 80% of the world’s population lives on less than $10 a day. There are two billion children on the planet, more than half live in poverty. Poverty stats are as accessible as they are undeniable. I won’t quote any more. My point is this: We live in the 1% and unless we figure out a way to fix Earth for the 99%, we’re all screwed. 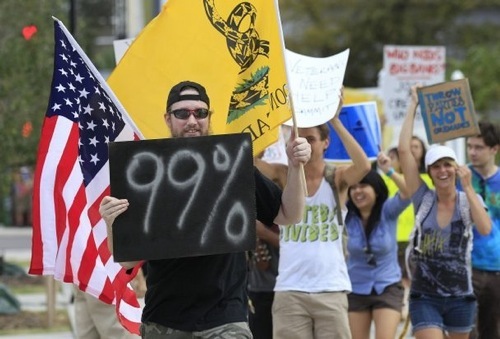 The 99% represented by the U.S. protestors are barely 4.8% of the global population. Few, if any, are in the global 99%. In fairness, there are signs from the OWS movement that the global issue is a concern, but their commitment to it feels thin and fleeting. I get the sense that they are more worried about their jobs and the screwing they’ve received from their Wall Street and choosing between paying rent and buying food than they are with the simple life and death calculus that real poverty brings. We need Occupy Earth – a truly global occupation that helps the 99% that really needs it. I haven’t made it properly known how happy I am with my new pen! 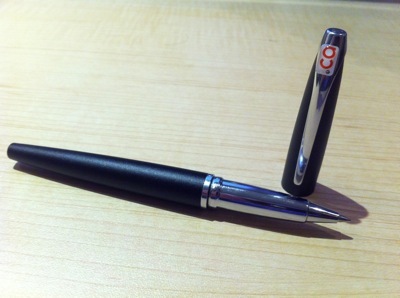 The pen was given to me as a token of appreciation for my service on the CIRA Board. Thanks .CA! I received a note from Google letting me know that they’d suspended some of my ad campaigns and that I should login to rectify. Clicking through, my suspicion was raised when I wasn’t automatically logged in like I normally am. Google *always* logs me in automatically, and usually into the wrong account. This gave me a cause to pause and I did a deeper inspection of the page and the email I’d received. Turns out, the email was a complete fake. A scam intended to con me into giving my Google credentials to a nefarious third party. 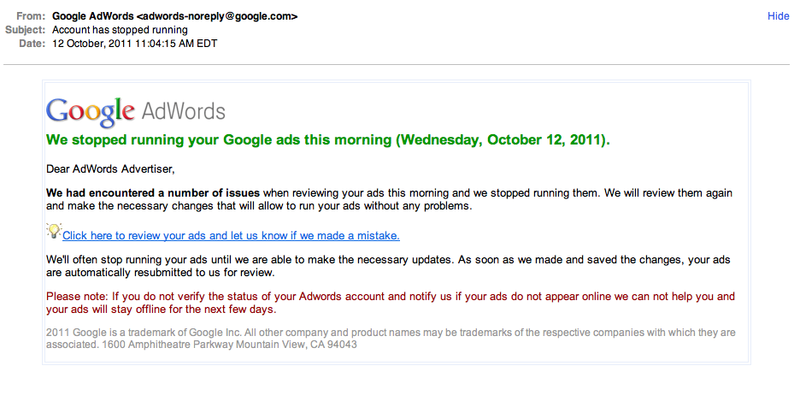 In this case, the email sends me to google-ows.com, a name that was only registered this morning. 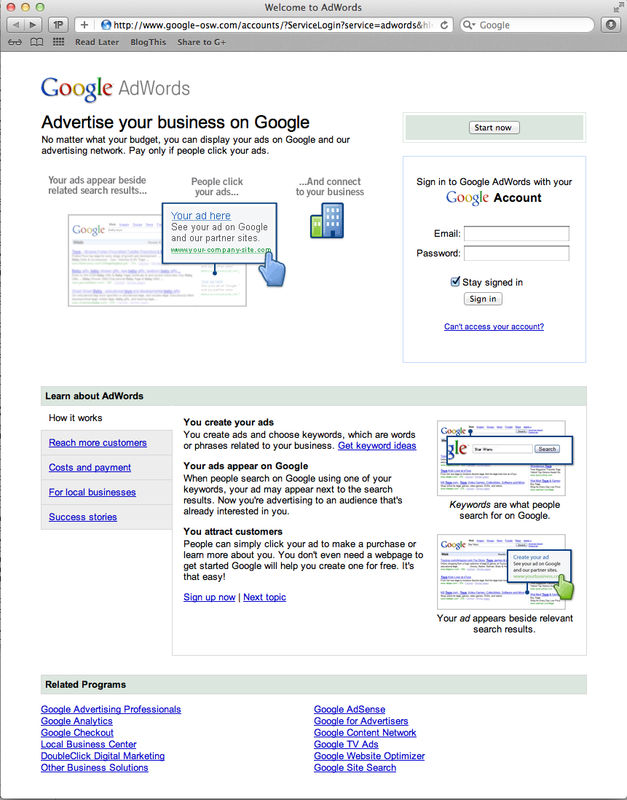 The page includes a script that collects your adwords username and password, which can also be used to sign into my other Google services – like GMail, etc. From there, who knows what the scam is, but it sets up the bad guys some pretty good access to your life if you fall for it.